At the beginning of the last year, I already raised the issue of post-exploitation in a Microsoft Active Directory domain. The brought forward approach addressed the variant aimed mostly at the case of the loss of admin privileges rather than their exploitation. Additionally, the action of regaining the privileges itself involved conspicuous events and visually evident manipulations in the directory. In other words, to regain admin privileges one had to become a member of the appropriate security group, such as Domain Admins. 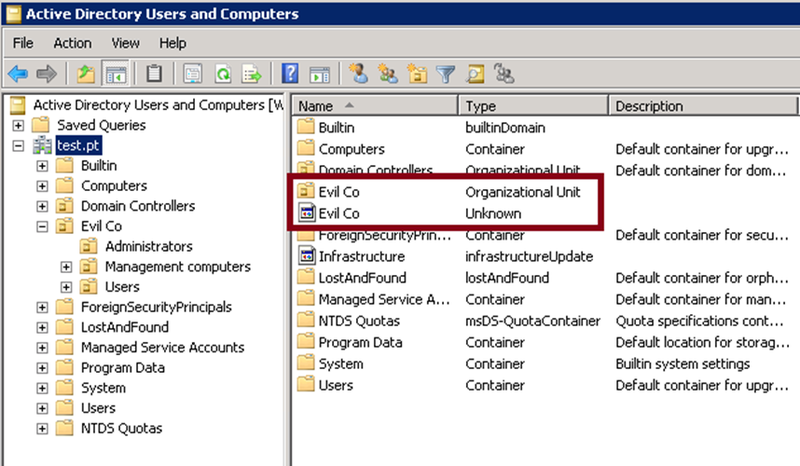 Now imagine how an Active Directory administrator of a large company can react when they see an unfamiliar account name in the Enterprise Admins security group. In case someone really intruded the system, the administrator’s concern is perfectly reasonable. However, in cases of improper counteraction when a pentest is taking place, it is certainly not worth worrying about (along with depriving the pentest guys of their access points and privileges gained with blood and sweat). I spent a lot of time thinking on how, without scaring administrators, to use the privileges gained during pentest freely (especially with aggressive counteraction of administrators, as it was during my recent pentests). On the one hand, pentesters are strictly limited in their possibilities. For example, the rule of minimizing impact on the object is taken for granted. So, we cannot simply create and leave backdoors all around the network. On the other hand, there are absolutely clear goals that should be achieved before a happy administrator notices unauthorized activity and unplugs the computer. So how can a pentester remain unnoticed in Microsoft networks? The first thing that comes to my mind is to use an admin account. The access is legitimate, so it should not attract any special attention. However, as experience has shown, obtaining clear-text admin password is not always possible. In such cases the attack called Pass-the-Hash comes to your aid. It would be almost perfectly ok (almost, since the Pass-the-Hash type of attack narrows the possibilities of developing the attack, e.g. the RDP remote access protocol cannot be used), but in serious companies administrators gradually turn to smart cards, which do not allow conducting attacks based on the NTLM protocol faults. 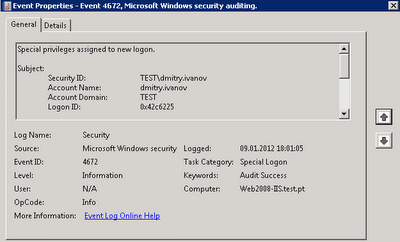 Ok, we still can exploit an authorized user's token (e.g., incognito) and/or a Kerberos ticket (e.g., WCE). That's as it may be, of course, but in practice Kerberos is not Kerberos and a token is not a token: available tools for conducting such types of attacks, unfortunately, are definitely lousy. Moreover, in both cases (just as in case of Pass-the-Hash), the attackers are rather limited in their actions by the protocols in use that support domain SSO. How, while doing this, not to be spotted by an attentive eye of the domain administrator? First, adding changes to Active Directory involves generation of certain events, about which administrators had better not know. So, before intruding a domain (of course, only as part of a pentest and only with an approval of your customer's representative) disable logging of security events on the domain controllers by using an appropriate GPO. Let me remind you that by default the time of group policies background refresh on domain controllers is 15 minutes. Second, why not to create a visually identical account that is analogous to the existing domain admin account? 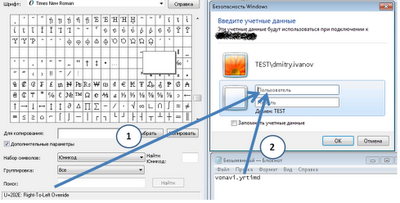 To achieve it, you can, for example, use Unicode symbols (!). Then, you can set the newly created user’s attribute showInAdvancedViewOnly to TRUE, which will allow you to hide the object in the default view mode of the Manage users and computers (dsa.msc) snap-in. After that, there is one remaining step: to assign the account to an administrative group which is free from a real domain admin (as a rule, administrators just can’t help assigning their accounts to all thinkable and unthinkable administrative groups), for instance, let’s leave the admin account in the Enterprise Admins group, and put its clone into the Domain Admins group. 1. The created account is visible in the directory to an ‘aided eye’. 2. When searching for users in the domain, the admin account appears double. It would seem that the simplest solution is obvious: to set the permissions on the newly created object (our account) appropriately. It is sufficient to forbid the Everyone group to read public information about the object. 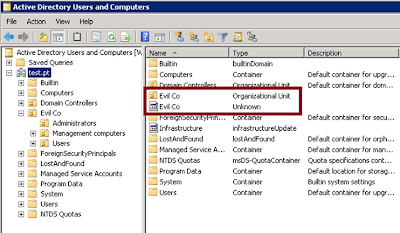 And in the organization unit, next to the real Active Directory admin, ‘something’ will appear, and this ‘something’ will cease to let itself be noticed in the output of domain accounts search. However, this dolce vita will last not more than 60 minutes. The thing is that by default every 60 minutes the SDPROP process runs on the domain controller which acts as a PDC emulator. 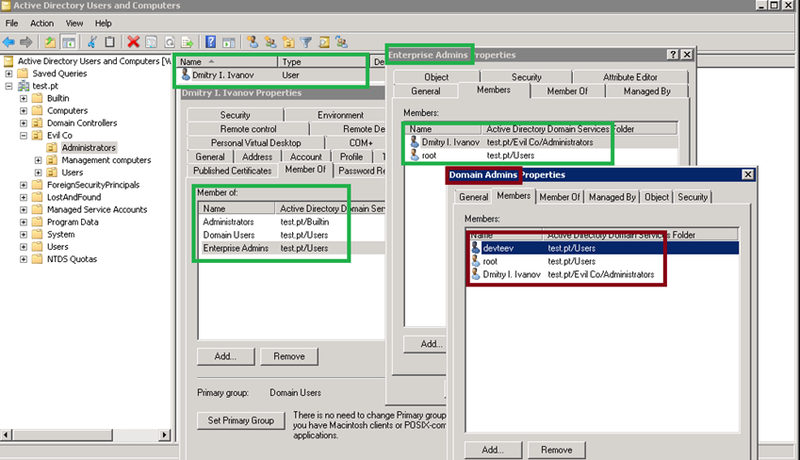 The process restores access rights of some Active Directory objects (including all members of administrative groups) according to the defined permissions on the AdminSDHolder object (http://technet.microsoft.com/en-us/query/ee361593). Unfortunately, it is impossible to disable the security mechanism by using standard functionality. A hacking attempt via exploiting permissions on the object may cause replication problems (here it starts to smell of sort of sabotage, which is inadmissible when pentesting). Changing ACLs on the AdminSDHolder object will affect many objects, including all domain admins accounts. So, as a possible feasible solution you may want to use regular running of a script which redresses the consequences of the SDPROP process actions. However, there is even a better alternative. The SDPROP process restores ACE for specific privileged objects only, but ACEs of organization units that contain such objects remain unchanged. That is just the thing for exploitation! Using Unicode symbols you can freely create organizational units sequence analogous to the one that contains the clone account. "Correct" permissions on the parent container allow hiding it from the sharp eye of administrators (within reasonable limits, of course). And one more thing. 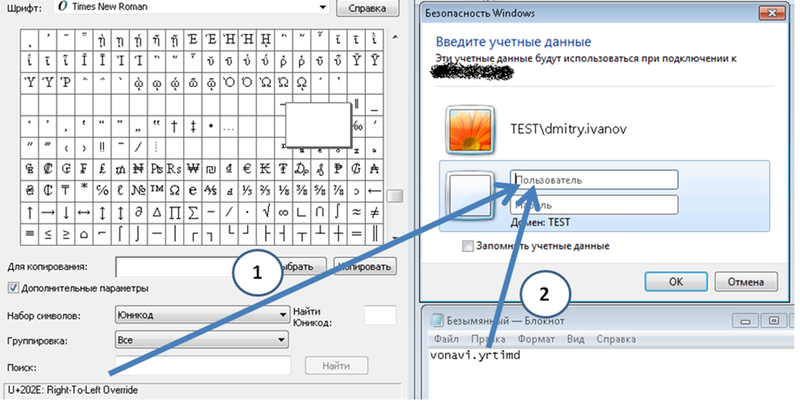 In order to avoid appearing of the doubles of the accounts when searching in the directory, you can use, for instance, the 202E symbol (my thanks to Alexander Zaitsev for reminding me this). The symbol turns over the string that follows it. So, if you create, for example, a clone for the ‘dmitry.ivanov’ account, the newly created account name will look like ‘202E’+’vonavi.yrtimd’. Perhaps this approach is not very convenient for authenticating in the system, but it helps avoid appearing in the search input. In the aspect of security event logs, the approach also allows you to remain unnoticed for a certain period of time. strPassNewUser is the password that should be set for the newly created account.